The Illinois veto session has come and gone with some good news. SB 81, which was the minimum wage bill that was passed and then vetoed by the Governor, did not get called during session for override. SB 81 would have raised the minimum wage up to $15 per hour. Another bill of note was the passing of SB 867 which reduces the fee collected by the Secretary of State for the filing of articles of organization, applications for admission, and restated articles of organization from $500 to $39 and reduces those fees in connection with a limited liability company with ability to establish series from $750 to $59. SB 1451 also passed both the House and Senate, but awaits a motion to reconsider. SB 1451 would deploy 5G technology to Illinois by utilizing small cell technology. Small cells are ﬂexible network solutions that can be readily deployed to speciﬁc locations, including those where customers are prone to experience connectivity issues or in areas that can’t effectively be served by a traditional cell tower. Today the US House of Representatives passed H.R. 1, the Tax Cuts and Jobs Act. This legislation consolidates seven current individual income rates into four, keeping the top rate at 39.6%. Standard deduction will now stand at $12,200 for individuals and $24,000 for joint filing. State and Local property tax deductions remain in the House bill, but capped at $10,000. However, you’ll no longer be able to deduct other taxes paid to state or local government. Mortgage interest and charitable deductions remain. The child tax credit would increase to $1,600 per child and a new $300 per – person family tax credit for those not eligible for the child tax credit. The bill makes no changes to retirement plans such as a 401k. The corporate tax rate will be rolled back to 20% from the current 35%. How about the pass through rate? 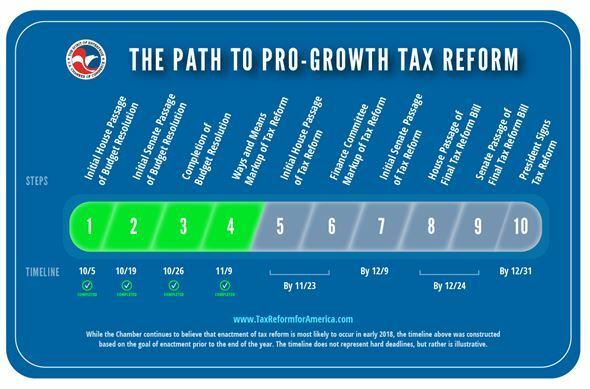 Now, 70% of the income pass-through businesses earn will be taxed at the rate of the business owner’s individual tax rate (25, 35, or 39.6%) and the remaining 30% will be taxed at a rate of 25%. It is estimated that 95% of U.S. businesses are pass-through companies, meaning the income earned from the business is passed through to the owner’s individual income tax. The next step will be on to the Senate for their version and attempt to pass.